When it comes to plumbing issues, every home should have a plumbing emergency kit on hand. And while every homeowner does not need to know how to fix every plumbing fiasco, it’s still important to have a basic, working knowledge of what to do during both minor and major plumbing emergencies. For example, a minor emergency that is usually an easy fix is a clogged toilet. On the other hand, a burst pipe is a major plumbing emergency that can require the help and support of a professional plumber. Either way, it’s important to be prepared for whatever plumbing problems come your way. One of the most crucial things to know is where your home’s shutoff valve is located, as well as keeping a fully-stocked emergency plumbing kit on hand for those “surprise” issues that can arise. A Plunger. Every home should have at least one plunger. Most professional plumbers also suggest separate plungers for sinks. A Five-Gallon Bucket. A large bucket can come in handy for leaking pipes and cleaning up bigger water issues. 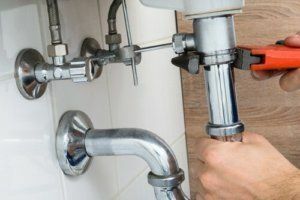 Many plumbers have seen drains connected to garbage disposals that work their way loose from the vibration of the disposal motor, spilling the contents of the drain underneath the sink. A five-gallon bucket and some old bath towels can make for a quick cleanup of wet messes. Basic Tools. A toolbox with a few wrenches can be a very good idea. Water shutoff valves at outdoor spigots, washing machines and pipe junctions can start to leak when the nut at the valve stem gets loose. A bit of tightening can often fix the problem. Allen Keys. Allen keys come in handy when you need to remove handles on faucets that either have a Phillips head or Allen screws holding them on. Duct Tape. Duct tape is a great aid in temporarily sealing up leaks in drain lines under sinks that start to leak. (In fact, many professionals use duct tape to stop a leak at connection joints, and say it never leaks again). Putty and Tape. Plumbers putty and Teflon tape are items many professional plumbers always keep on hand. For example, they are used when replacing a faucet (the putty acts as a seal between the faucet and sink). Teflon tape is also used on metal-to-metal thread connections of water lines to the faucet. A few wraps around the brass threads of faucets helps to prevent leaks. For minor plumbing problems – think a clogged drain or small leak – it can save you both time and money to try and fix the problem yourself before calling a professional plumber. However, if you do not think you can handle the issue yourself, always consult a professional to prevent further damage to your plumbing system. Furthermore, if you are ready to take the “plunge” into updating and remodeling your bathroom, we can offer our expert advice and knowledge. Call Republic West Remodeling today for the best bathroom remodeling in Scottsdale.